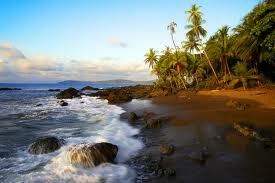 I just returned from the most amazing retreat in Costa Rica. While taking Qoya classes (dance yoga for women) with the amazing Rochelle Sheik, we talked about life being just like the ocean. To go for a lovely swim, you have to navigate big waves, little waves, no waves and maybe, if you're super unlucky, a tsunami! The ocean is always changing, just like life. I love this analogy for writing too. Some days you will be writing on a still ocean and inspiration will flow out easily. Other days you will hit big waves that are tiring and seem impossible to swim past. But as long as you know that's just the ebb and flow of the ocean, you continue on. So continue on and relax knowing it's all just part of the plan.